1st Independent Battery: At Belle Plain, Virginia with six 3-inch Ordnance Rifles. Captain Andrew Cowan commanded the battery assigned to Second Division, Sixth Corps, Army of the Potomac. 2nd Independent Battery: No return. At the start of the winter, Captain Louis Schirmer commanded this battery, assigned First Division, Eleventh Corps. When Schirmer was promoted to command the corps’ artillery reserve later in the spring, Captain Hermann Jahn took command of the battery. 3rd Independent Battery: At Potomac Creek, Virginia with six 10-pdr Parrotts (an increase from the last quarter). The battery served in Second Division, Sixth Corps, under Lieutenant William A. Harn. 4th Independent Battery: No return. Assigned to Second Division, Third Corps. We are familiar with the 4th, thanks to their stand at the Devil’s Den at Gettysburg, and know they had six 10-pdr Parrotts. Through the winter, the battery saw several officers depart for other commands and Lieutenant George F. Barstow, 3rd US Artillery, took command late in the winter. “The men were despondent,” Captain James E. Smith later recounted, “and became lax in their duties, not without some excuse.” For this, and other reasons, Smith returned to command his old battery in May. 5th Independent Battery: At Falmouth, Virginia with four 20-pdr Parrotts. This was Captain Elijah D. Taft’s battery in the Army of the Potomac’s Artillery Reserve. 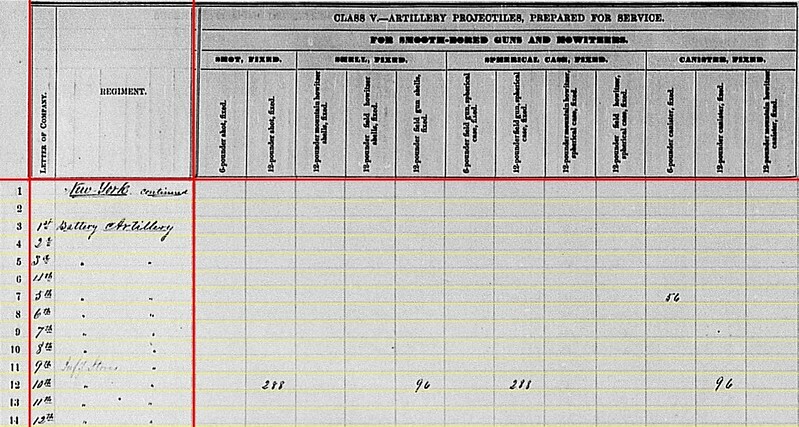 6th Independent Battery: No location listed, but with six 3-inch Ordnance Rifles. At the start of the winter, the 6th was under Captain W. M. Bramhall and part of the Artillery Reserve. By spring, Lieutenant Joseph W. Martin assumed command with the battery transferred to the Horse Artillery (First Division, Cavalry Corps, Army of the Potomac). 7th Independent Battery: At Norfolk, Virginia with six 3-inch Ordnance Rifles. Captain Peter C. Regan’s battery supported the Seventh Corps. 8th Independent Battery: At Yorktown, Virginia with six 3-inch Ordnance Rifles. Part of the Fourth Corps, on the Peninsula, Captain Butler Fitch commanded this battery. 9th Independent Battery: Fort Reno, District of Colulmbia, with only infantry stores. Captain Emil Schubert, of the 4th US Artillery, was commander of this battery, assigned to the Twenty-Second Corps. As indicated, the battery was not equipped as light artillery. 10th Independent Battery: At Falmouth with six 12-pdr Napoleons. Lieutenant Samuel Lewis replaced Captain John T. Bruen during the winter. The battery remained with Third Division, Third Corps until later in the spring. 11th Independent Battery: Also at Falmouth but with six 3-inch Ordnance Rifles. Battery also assigned to Third Division, Third Corps. Lieutenant John E. Burton replaced Captain Albert Von Puttkammer in command. 12th Independent Battery: At Camp Barry, Artillery Camp of Instruction, District of Columbia and reporting four 3-inch Ordnance Rifles. Captain George F. McKnight replaced Captain William H. Ellis. A few changes in command and only one significant transfer through the winter. And not many changes in the number and type of cannon. Notice all these batteries served in the Eastern Theater. More specifically, in Virginia and the defenses of Washington. But we have two lines? 5th Battery: 56 canister for 6-pdr field guns. 10th Battery: 288 shot, 96 shell, 288 case, and 96 canister for 12-pdr Napoleon. Why would Taft’s Battery have canister for 6-pdr smoothbores? Perhaps for use in their 20-pdr Parrotts. The bore size was the same. Notably, the battery didn’t report these in the previous quarter. Meanwhile, 10th Battery seemed short of ammunition for it’s Napoleons. No change from the previous quarter’s report. Such leads me to believe someone made “quick work” of their duties. 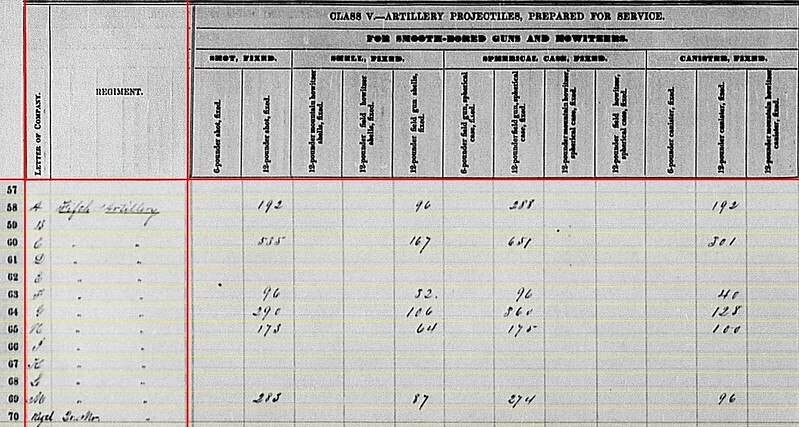 1st Battery: 129 canister, 211 percussion shell, 370 fuse shell, and 570 bullet shell for 3-inch rifles. 6th Battery: 59 canister, 285 percussion shell, 44 fuse shell, and 323 bullet shell for 3-inch rifles. 7th Battery: 114 canister, 47 percussion shell, 259 fuse shell, and 715 bullet shell for 3-inch rifles. 8th Battery: 175 canister and 45 percussion shell for 3-inch rifles. 11th Battery: 151 canister, 258 fuse shell, and 775 bullet shell for 3-inch rifles. 12th Battery: 137 canister, 73 percussion shell, 40 fuse shell, and 120 bullet shell for 3-inch rifles. 8th Battery: 369 shell and 650 shrapnel for 3-inch rifles. 3rd Battery: 480 shell , 480 case, and 190 canister of Parrott for 10-pdr Parrotts. 5th Battery: 45 Parrott Shell for 20-pdr Parrotts. 1st Battery: 29 Schenkl shell for 3-inch rifles. 3rd Battery: 120 Schenkl shell for 10-pdr Parrotts. 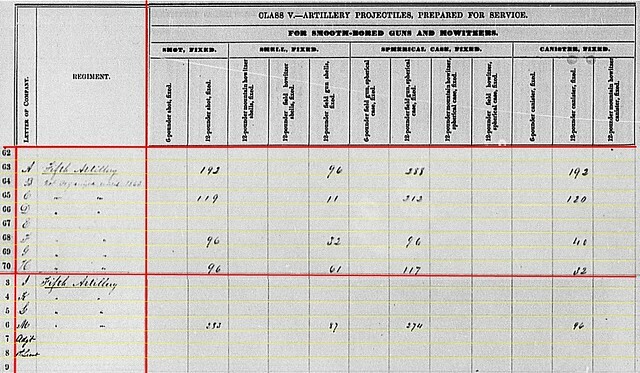 1st Battery: Twenty-eight Navy revolvers, eight cavalry sabers, and fifteen horse artillery sabers. 3rd Battery: Four Army revolvers and twelve cavalry sabers. 5th Battery: Twenty-three Army revolvers and twenty-one horse artillery sabers. 6th Battery: 155 Navy revolvers, twenty cavalry sabers, and two horse artillery sabers. 7th Battery: Eighteen Navy revolvers and twenty-six cavalry sabers. 8th Battery: Fourteen Navy revolvers and fourteen horse artillery sabers. 10th Battery: Fifty-eight Navy revolvers and eleven horse artillery sabers. 11th Battery: Twenty Army revolvers and twenty-two cavalry sabers. 12th Battery: Twenty-eight Army revolvers and twenty-nine horse artillery sabers. For the next installment, we’ll look at the second batch of New York’s independent batteries – 13th through 24th. Battery A: At Suffolk, Virginia with six 12-pdr Napoleons. Battery A began the winter under Third Division, Ninth Corps, commanded by Lieutenant George Crabb, outside Fredericksburg. By March, the battery was under Lieutenant James Gilliss, supporting the same division at Suffolk. Battery B: No report. This new battery continued to form-up at Fort Hamilton through the winter and spring of 1863. Battery C: Reporting at Belle Plain, Virginia with six 12-pdr Napoleons. Captain Dunbar R. Ransom commanded this battery supporting Second Division, First Corps. The battery added two Napoleons over the previous quarter. Battery D: Falmouth, Virginia with six 10-pdr Parrotts. We find Lieutenant Charles Hazlett’s battery supporting First Division, Fifth Corps with the six Parrotts that would go on to some renown on some small hill later in the summer. Battery E: At Fort Hamilton, New Jersey but without cannons. As with Battery B above, Battery E was still organizing, under regimental headquarters’ charge, at this point in the war. Battery F: White Oak Church, Virginia, with two 12-pdr Napoleons and four 10-pdr Parrotts. Lieutenant Leonard Martin commanded this battery (though Captain Romeyn B. Ayres held command on early winter returns, split between battery and brigade postings). The battery supported Second Division, Sixth Corps. Battery G: Way out in Baton Rouge, Louisiana with six 12-pdr Napoleons. Lieutenant Jacob B. Rawles commanded this battery from Second Division, Nineteenth Corps. Battery H: Wintering at Murfreesboro, Tennessee and armed with four 12-pdr Napoleons and two 10-pdr Parrotts. With the reorganization of the Army of the Cumberland, Lieutenant Francis Guenther took his battery to First Division, Fourteenth Corps. Battery I: At Falmouth, Virginia but reporting no cannon. Lieutenant Malbone F. Watson commanded this battery in support of Second Division, Fifth Corps. Other records indicate this battery had four 3-inch Ordnance Rifles. Battery K: Also at Falmouth and with four 12-pdr Napoleons. Lieutenant David H. Kinzie led this battery of the Artillery Reserve, Army of the Potomac. 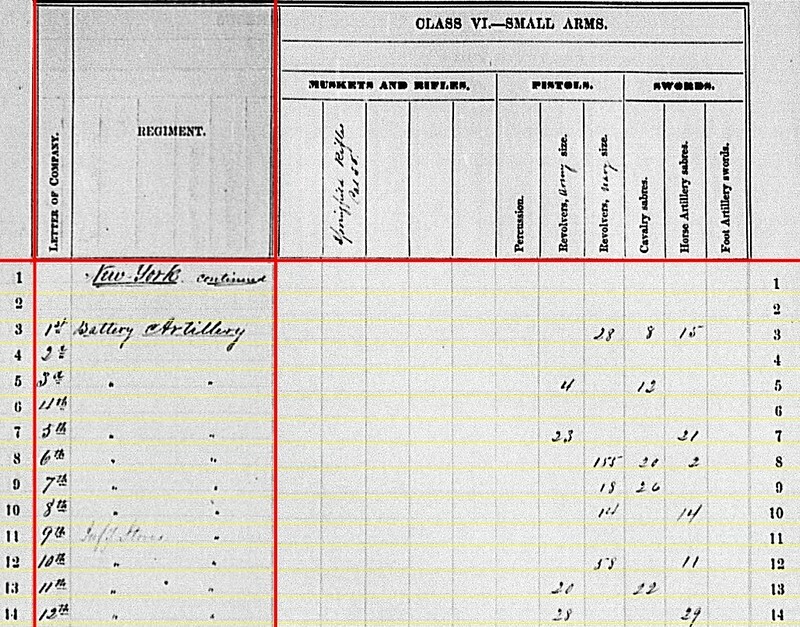 Battery L: Reporting at Winchester, Virginia with six 3-inch rifles. Lieutenant Edmund D. Spooner’s battery joined Milroy’s command at Winchester at the start of spring that year. Battery M: At Yorktown, Virginia with six 12-pdr Napoleons. Captain James McKnight’s battery was unassigned, but part of the Seventh Corps at this phase of the war. Regimental HQ: “Sr. Maj.” maybe? At any rate, reporting from Fort Hamilton. For those curious, the equipment on hand included a battery forge, a battery wagon, and a fair quantity of implements, accouterments, and supplies. So from an organizational perspective, we don’t see a lot of changes with the batteries of the regiment. Nor any significant changes in cannon reported. Battery A: 192 shot, 96 shells, 288 spherical case, and 192 canister for Napoleons. Battery C: 535 shot, 167 shell, 651 case, and 301 canister in 12-pdr Napoleon. Battery F: 96 shot, 32 shell, 96 case, and 40 canister all for 12-pdr Napoleon. Battery G: 190 shot, 106 shell, 360 case, and 128 canister in 12-pdr Napoleon. Battery H: 173 shot, 64 shell, 175 case, and 100 canister for the Napoleons. Battery K: No quantities reported.. Battery M: 283 shot, 87 shell, 274 case, and 96 canister for their Napoleons. Battery L: 120 canister, 120 percussion shell, 240 (or 340) fuse shell, and 720 bullet shell for 3-inch rifles. Battery I is noticeably absent quantities again. Battery D: 72 shell, 500 case, and 24 canister for 10-pdr Parrott. Battery F: 160 shell, 320 case, and 96 canister for 10-pdr Parrott. Battery H: 250 shell, 56 case, and 94 canister for 10-pdr Parrott. Comparing to the previous quarter, Battery D’s and Battery F’s quantities remained the same; and Battery H reported a smaller quantity of 10-pdr shell. Battery D: 251 Schenkl shell for 10-pdr Parrott. Battery F: 320 Schenkl shell for 10-pdr Parrott. Battery D’s quantities did not differ from the previous quarter. Battery F appears to have lost 320 Schenkel 10-pdr shot listed in the last quarter, then gained the same quantity of shell. Go figure. Battery A: Twenty-nine Army revolvers, one cavalry saber, and sixty-five horse artillery sabers. Battery C: Twenty-seven Army revolvers, twenty-six Navy revolvers, and nineteen horse artillery sabers. Battery D: Twelve Navy revolvers and eight horse artillery sabers. Battery E: One-hundred-and-ten horse artillery sabers. Battery F: Twenty-seven Army revolvers and twenty-four horse artillery sabers. Battery G: Twenty-two horse artillery sabers. Battery H: Sixteen Army revolvers, five Navy revolvers, and thirty-nine cavalry sabers. Battery L: One-hundred-and-fifty horse artillery sabers! I can see a use for Battery E, which was still forming, to have a large number of sabers on hand. We might presume there was a lot of saber drill going on at Fort Hamilton. But Battery L? I guess they would put those 150 sabers to good use later in the summer. 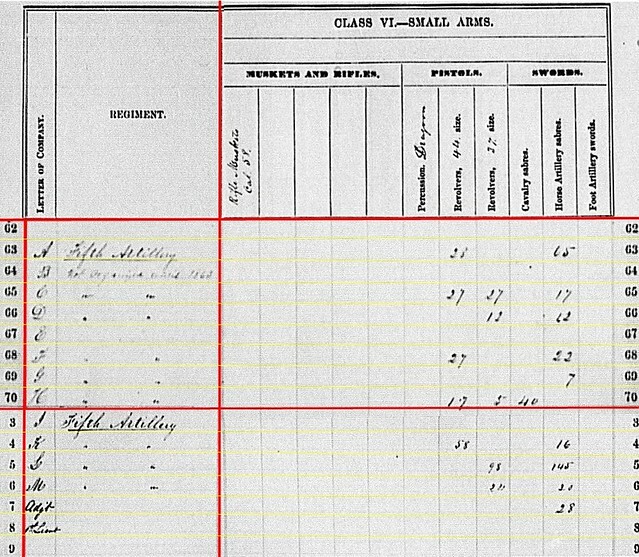 When reviewing the 4th US Artillery Regiment’s summary from the fourth quarter, 1862, we saw an extra line designated for the “Colonel” of the regiment. That line covered tools and stores on hand at Fort Washington, Maryland. The equipment, which did not include any cannons but did include some small arms, were items not issued to batteries. Presumably, Colonel Charles S. Merchant, commander of the regiment (more a “paper” command, of course) had direct responsibility for those stores. Not a significant change, but one worth pause for discussion. When an officer received equipment, he was responsible for the care, maintenance, and, very importantly, accountability of the equipment. An officer might be held liable if the equipment is damaged or lost while assigned to him. When the equipment was transferred, the officer needed documentation to support relief from responsibility. This is one reason we often find correspondence between officers discussing relatively trivial matters of equipment. That said, there was probably some document in Merchant’s personal papers concerning the transfer of three revolvers or various implements to another party. The good colonel would not want some trouble over such trivial issues to detain him later. Just something to consider when looking through correspondence. Battery A – At Falmouth, Virginia with six 3-inch Ordnance Rifles. The battery was assigned to the artillery reserve of Second Corps, Army of the Potomac. During the winter, Lieutenant Alonzo Cushing replaced Lieutenant Samuel Canby in command of the battery. Battery B – Reporting in from Belle Plain, Virginia with six 12-pdr Napoleons. Lieutenant James Stewart commanded this battery assigned to First Division of the First Corps. Battery C – Around Falmouth, Virginia with six 12-pdr Napoleons. Supporting First Division, Second Corps and commanded by Lieutenant Evan Thomas. Battery D – From Suffolk, Virginia and reporting six 3-inch Ordnance Rifles. Assigned to Seventh Corps and commanded by Captain Frederick M. Follett. Battery E – No report. Transferred from the Ninth Corps in February, Lieutenant Samuel S. Elder’s battery became part of the Horse Artillery assigned to the Cavalry of the Army of the Potomac. Battery F – At Stafford Court House, Virginia with six 12-pdr Napoleons. Lieutenant Franklin B. Crosby, who would not survive the Chancellorsville Campaign, commanded this battery supporting First Division, Twelfth Corps. Battery G – Outside Fredericksburg, Virginia with six 12-pdr Napoleons. Assigned to the Army of the Potomac’s Artillery Reserve and commanded by Lieutenant Marcus P. Miller. 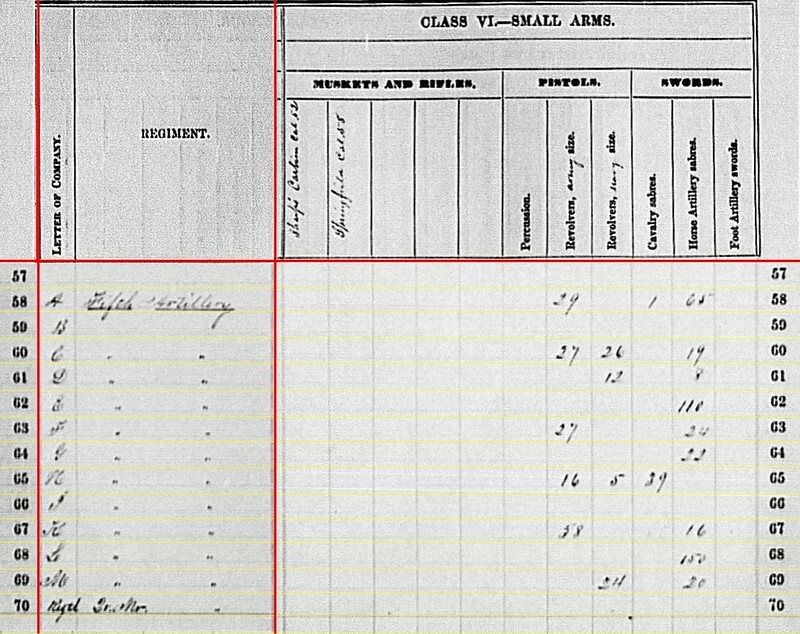 Battery H – Out in Murfreesboro, Tennessee and in possession of four 12-pdr field howitzers. In January, Batteries H and M (below) split. Lieutenant Charles C. Parsons retained command of the battery at that time, but later in the springpassed command of the battery to Lieutenant Harry C. Cushing. Battery H supported Second Division, Twenty-First Corps. Battery I – Winchester… Tennessee, not Virginia with four 12-pdr Napoleons. Lieutenant Frank G. Smith commanded this battery, supporting Third Division, Fourteenth Corps. Battery K – Another battery at Falmouth, Virginia with six 12-pdr Napoleons. Lieutenant Francis W. Seeley remained in command of this battery, which was assigned to Second Division, Third Corps. Battery L – At Suffolk, Virginia with two 12-pdr field howitzers and four 10-pdr Parrotts. Lieutenant Henry C. Hasbrouck commanded this battery of Seventh Corps. Battery M – At Murfreesboro, Tennessee reporting four 12-pdr Napoleons and two 24-pdr field howitzers. After the split with Battery H, Lieutenant Francis L. D. Russell assumed command. The battery supported Second Division, Twenty-First Corps. Note that all but one battery’s return was received in Washington for the quarter. And those received between April and August of 1863. The 4th Artillery kept on top of their paperwork. Battery B – 216 shot, 92 shell, 216 case, and 92 canister for 12-pdr Napoleon. Battery C – 96 shot, 96 shell, 384 case, and 192 canister for 12-pdr Napoleon. Battery F – 252 shot, 76 shell, 252 case, and 76 canister for 12-pdr Napoleon. Battery G – 86 shot, 35 shell, 103 case, and 40 canister for 12-pdr Napoleon. Battery H – 240 shell and 240 case for 12-pdr field howitzer. Then 128 in the column for 12-pdr mountain howitzer canister. Though as mentioned last week, I think this was the clerk’s expediency and was actually canister for field howitzer of the same caliber. Battery I – 200 shot, 64 shell, 188 case, and 64 canister for 12-pdr Napoleon. Battery K – 288 shot, 96 shell, 288 case, and 96 canister for 12-pdr Napoleon. Battery L – 140 shell and 154 case for 12-pdr field howitzer. 32 canister for 12-pdr mountain or field howitzer, as the case may be. Battery M – Here’s a question of what should have been. The battery reported no ammunition for its 24-pdr field howitzers. I’ve shown the empty columns here (split to the right as they appear on the next page of the form). So were the ammunition chests empty? One other question comes to mind when comparing the numbers to the previous quarter. There are no changes, for the most part, in reported quantities within the batteries supporting the Army of the Potomac. Is that to say the batteries were “topped off” in December 1862 and needed no more? Or might this be a “copy what we reported last quarter” approach to filling the form? Either way we have a reason to question the quantities. Battery A – 120 canister, 50 percussion shell, 305 fuse shell, and 725 bullet shell for 3-inch rifle. And note, these are the same quantities reported by the battery for the previous quarter…. go figure. Battery D – 53 canister, 49 percussion shell, 342 fuse shell, and 576 bullet shell for 3-inch rifle. Now these quantities do differ from the previous quarter. Battery L – 480 shell, 240 case, and 96 canister for 10-pdr Parrott. And yes, that is exactly what Battery L reported the previous quarter… the trend continues. Battery A – Seventeen Army revolvers and twenty-five horse artillery sabers. Battery B – Thirty-seven Navy revolvers and twenty-four cavalry sabers. Battery C – Thirteen navy revolvers and thirty-two cavalry sabers. Battery D – Nine Army revolvers and 139 horse artillery sabers. Battery F – Sixteen Army revolvers and thirteen horse artillery sabers. Battery G – Seven Navy revolvers and Ninety-three horse artillery sabers. Battery H – Seventeen Army revolvers and six cavalry sabers. Battery I – Four Army revolvers and forty-three cavalry sabers. Battery K – Twelve Army revolvers, two Navy revolvers and fifteen horse artillery sabers. Battery L – Fourteen Army revolvers and 118 horse artillery sabers. Battery M – Seven Army revolvers and seventeen cavalry sabers. I would point out these quantities differ from those reported the previous quarter. And such leaves a conundrum. Are we to conclude the ammunition quantities reported were accurate, with little to no resupply over the winter? Perhaps there was some omission, across the board, of ammunition numbers? Or maybe some clerical magic was in play? And I’m sure you can come up with other possibilities. Again, the point here is that the summaries should not be considered very accurate of data sets. We have to keep the anomalies and questions in mind. But… they are the most complete sets of data available for the subject! 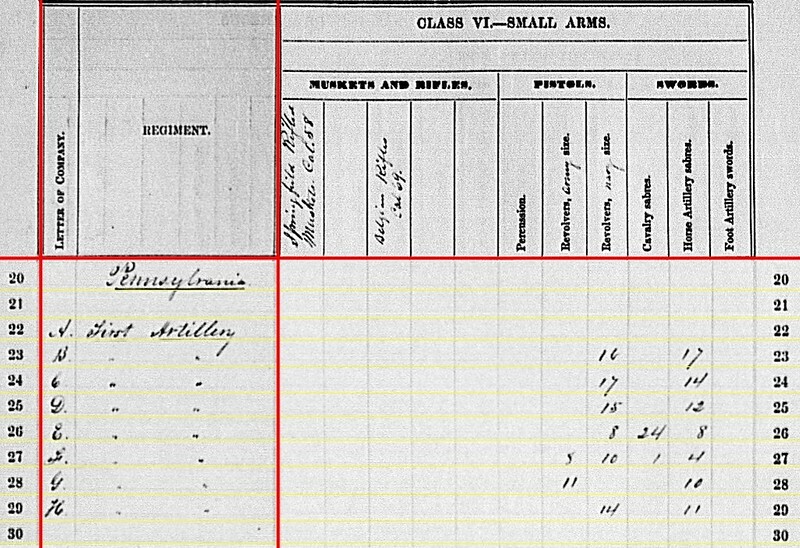 If you are “Willing and Able”* we will look at the 5th Artillery’s portion of the December 31, 1862 summary statement. Unlike the other regular artillery regiments, the 5th did not have a history dating back to pre-war days. It was formed on May 4, 1861. Though a “young” formation, the batteries saw considerable action in the first two years of the war. 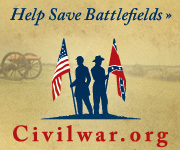 But again, this post will focus on the state of affairs at the end of December 1862. As with previous installments, the yellow lines are the rules across the page, to help us verify the numbers. The red lines are where I’ve “cut” a portion of the page to bring column headers and line declarations into view. Please notice there are two horizontal red lines in these tables. The 5th Artillery’s statement spans from the bottom of one set of pages and onto the next. Yes, that complicates the effort. But no bayonets or scissors are needed, thanks to some digital tools. Battery A: Newport News, Virginia with six 12-pdr Napoleons. 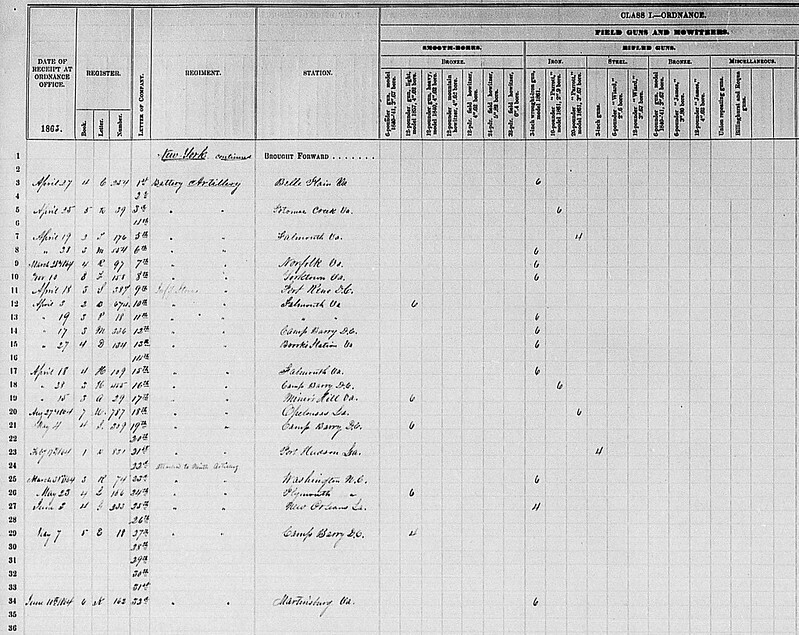 The location may reflect the assignment at the time of the ordnance report filing (March 1863). Battery A was part of Ninth Corps, Army of the Potomac, at Fredericksburg and participated in the “Mud March” of January 1863. Battery A remained with the corps when transferred to the Department of Virginia, arriving at Newport News in February. 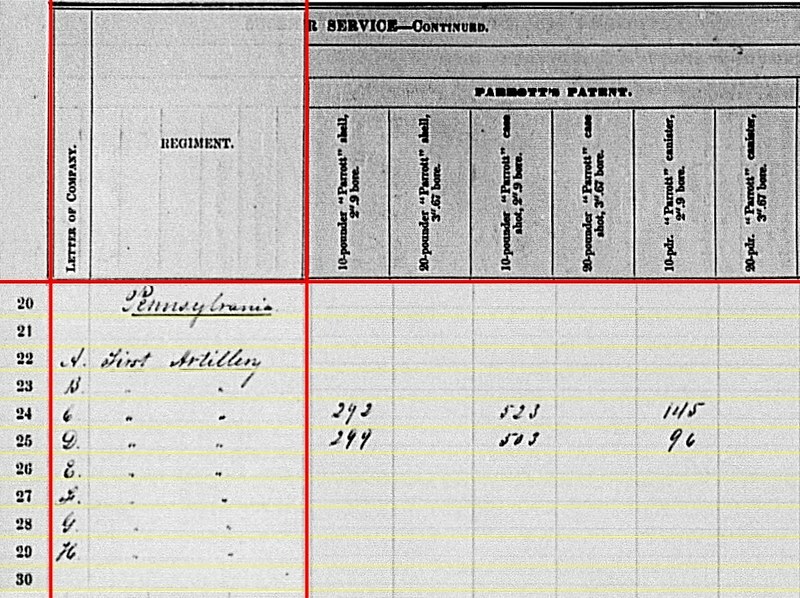 Battery B: “Not organized until 1863.” This battery was still forming at the reporting time. Personnel were on duty at Fort Hamilton, New York. Battery C: At Belle Plain, Virginia with four 12-pdr Napoleons. Assigned to First Corps, Army of the Potomac. Battery D: At Falmouth, Virginia with six 10-pdr Parrotts. Assigned to Fifth Corps, Army of the Potomac. Battery E: No return filed. Like “B” above, Battery E was still getting organized and personnel were on duty at Fort Hamilton. Battery F: At Berlin, Maryland with two 12-pdr Napoleons and four 10-pdr Parrotts. 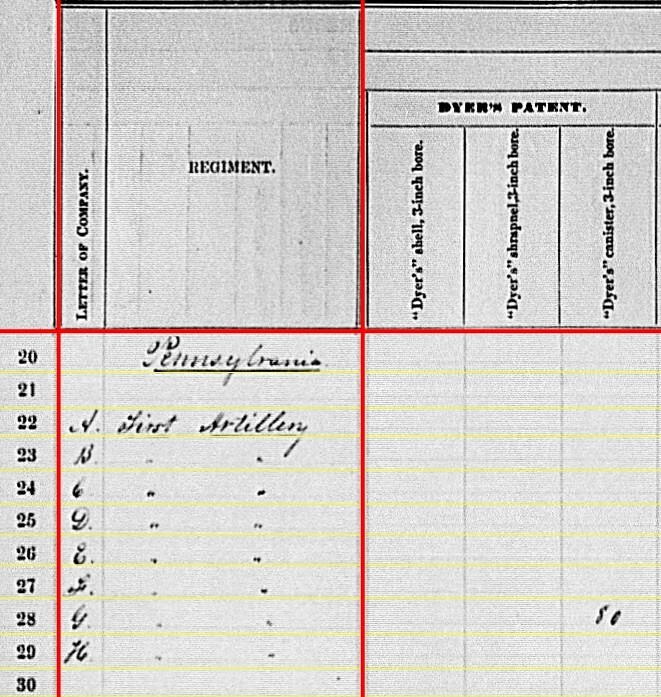 As with Battery A, the location is another “conundrum.” As with its sister, Battery F’s location may reflect that at the time of report filing. In December 1862, Battery F supported Sixth Corps, Army of the Potomac, on the banks of the Rappahannock. However, in July 1863, when the report was filed, the battery was moving through Berlin, Maryland with the pursuit after Gettysburg. Of note, by July 1863 the battery had six Parrotts. Battery G: New Orleans, Louisiana. No cannons reported. The battery was in transit from Fort Hamilton to the Department of the Gulf. Battery H: Murphreesboro, Tennessee with four 12-pdr Napoleons and two 10-pdr Parrotts. Engaged at Stones River on December 31, thus explaining the delay with reporting, Battery H was part of an all “US Regulars” brigade in the Center Wing, Fourteenth Corps, Army of the Cumberland. Battery I: No return filed. Was assigned to Fifth Corps at Falmouth. Presumably retained four 3-inch Ordnance Rifles. Battery K: At Falmouth, Virginia with four 12-pdr Napoleons. Assigned to the Reserve Artillery, Army of the Potomac. Battery L: Baltimore, Maryland with six 3-inch Ordnance Rifles. Part of the Eighth Corps, Middle Department. Battery M: Location not indicated, but with six 12-pdr Napoleons. Battery M was part of the artillery reserve of Fourth Corps, then posted at Yorktown. 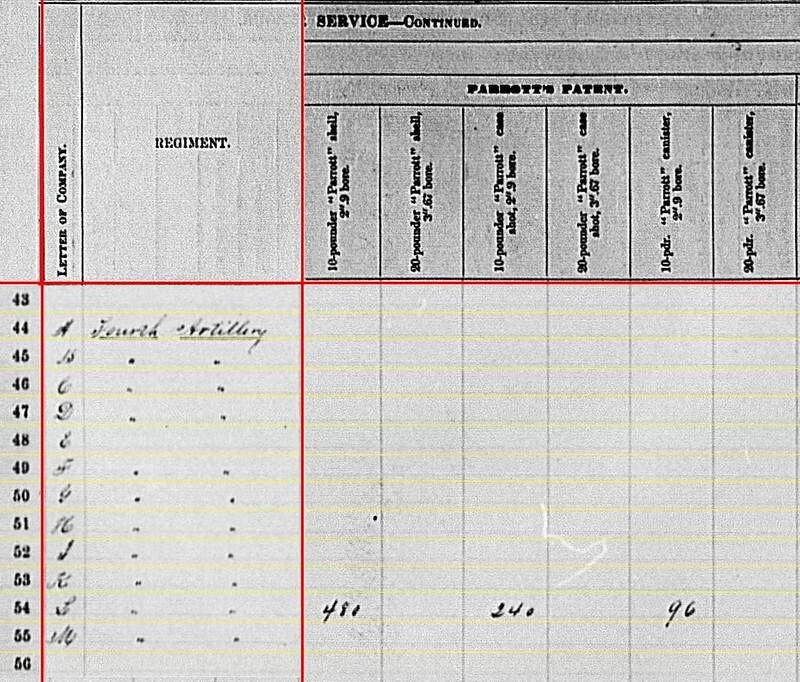 Two additional lines appear on the Fifth Artillery’s summary for the Adjutant and 1st Lieutenant. Both of these were at Fort Hamilton. No cannons or ammunition were reported under these lines. Just small arms and other equipment. Battery A: For 12-pdr caliber – 192 shot, 96 shells, 288 spherical case, and 192 canister. Battery C: 12-pdr caliber – 119 shot, 11 shell, 212 case, and 120 canister. Battery F: 12-pdr again – 96 shot, 32 shell, 96 case, and 40 canister. Battery K: 12-pdr – 96 shot, 61 shell, 117 case, and 32 canister. Battery M: 12-pdr – 233 shot, 87 shell, 274 case, and 96 canister. We see only Battery L with any quantity on hand – 720 3-inch shot and 241 fused shells. Would be interesting to compare Battery L’s quantities with Battery I’s… but the latter battery’s report did not find its way to the summary. Battery D: 10-pdr Parrott – 72 shells, 500 case, and 24 canister. Battery F: 10-pdr Parrott – 160 shells, 320 case, and 96 canister; 320 Schenkel 10-pdr shot (note, this is Schenkel pattern cast for Parrott guns). 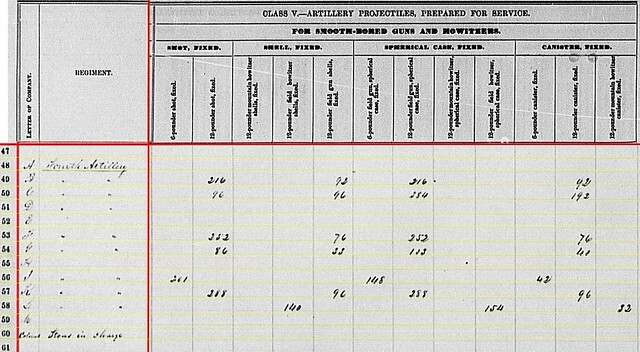 Battery H: 10-pdr Parrott – 310 shells, 93 case, and 63 canister. Battery D: 251 Schenkel-pattern 10-pdr Parrott shells. Battery L: 120 3-inch Schenkel shells and 120 3-inch canister, Tatham’s pattern canister. Battery A: 23 revolvers, .44 caliber, and 65 horse artillery sabers. Battery C: 27 .44-caliber and 27 .37-caliber revolvers. 17 horse artillery sabers. Battery D: 12 .37-caliber revolvers and 62 horse artillery sabers. Battery F: 27 .44-caliber revolvers and 22 horse artillery sabers. Battery G: 7 horse artillery sabers. Battery H: 17 .44-caliber revolvers, 5 .37 caliber revolvers, and 40 cavalry sabers. Battery K: 58 .44-caliber revolvers and 16 horse artillery sabers. Battery L: 98 .37-caliber revolvers and 145 horse artillery sabers. Battery M: 24 .37-caliber revolvers and 20 horse artillery sabers. Adjutant: 28 horse artillery sabers. This concludes the statements for the US Regulars. I’ll turn to the volunteer batteries next, in alphabetical order by states. NOTE: “Willing and Able” is the motto of the 5th Air Defense Artillery Regiment. The 5th Artillery, as formed in 1861, was by law just an artillery regiment, though all of its batteries were field or light batteries. In 1924 the regiment became the 5th Coast Artillery Regiment. Starting in the 1950s, most elements of the regiment became air defense units. But not until 1971 was the 5th Air Defense Artillery Regiment formally constituted to inherit the lineage of the 5th Artillery. The present day 5th Field Artillery Regiment dates to 1907 and does not share the same regimental crest as the air defense regiment. Among the heraldry depicted on the unit crest, a fishhook symbolizes the defensive position at Gettysburg and three pairs of cannons alluding to action at New Market in 1864. “No step backward” on the look at the summary statement from December 31, 1862. Some will get my reference. Others must be told that our focus is the 4th Regiment, US Artillery. Battery A: Warrenton Junction, Virginia. Six 3-inch Ordnance Rifles. Earlier in the war, Batteries A and C (see below) were consolidated. The two split in October 1862. Battery A supported Second Corps, Army of the Potomac. Battery B: Belle Plain, Virginia. Six 12-pdr Napoleons. The battery supported First Corps, Army of the Potomac. Battery C: Falmouth, Virginia. Six 12-pdr Napoleons. Inheriting the equipment of Battery A (above), Battery C also supported Second Corps. Battery D: Suffolk, Virginia. Six 3-inch Ordnance Rifles. Supported Seventh Corps, Department of Virginia. Battery E: No return indicated. Battery E supported Ninth Corps, and was outside Falmouth. My references indicate the battery had six 10-pdr Parrotts at the reporting time. Battery F: Location not indicated, but known to be near Falmouth. Six 12-pdr Napoleons. Part of Twelfth Corps, Army of the Potomac. Battery G: Again, no location, but near Falmouth. Six 12-pdr Napoleons. Battery G was in the Artillery Reserve, Army of the Potomac. Battery H: No return indicated. Battery H, consolidated with Battery M (see below), was part of the Army of the Cumberland at this time. They were rather busy while near Stones River on the report date. Battery H retained four 12-pdr field howitzers when the batteries split following the battle. Battery I: Location not indicated, but this battery was also with the Army of the Cumberland, though part of the Center Wing not engaged at Stones River. Two 6-pdr field guns and two 10-pdr Parrotts. Battery K: At Falmouth, this battery had six 12-pdr Napoleons. The battery was part of Third Corps, Army of the Potomac. Battery L: At Suffolk with two 12-pdr howitzers and four 10-pdr Parrotts. Battery L was part of the Seventh Corps. Battery M: No return indicated. As mentioned above, was consolidated with Battery H. After the battle of Stones River, Battery M retained four 3-inch rifles and gained two 24-pdr field howitzers. 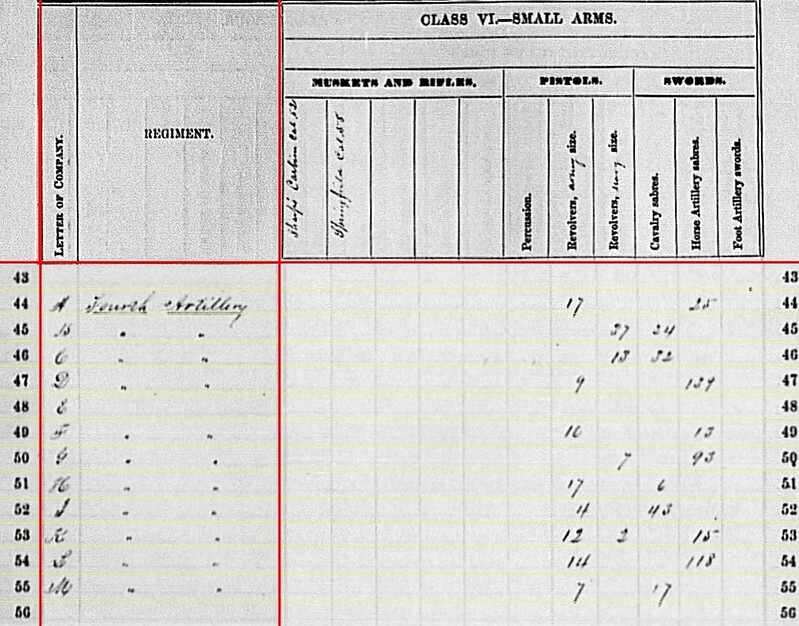 What is clear – On July 21, 1863 the Ordnance Department received a return from a command at Fort Washington, Maryland. That command was reporting “stores in charge,” or at least from the way I read it. 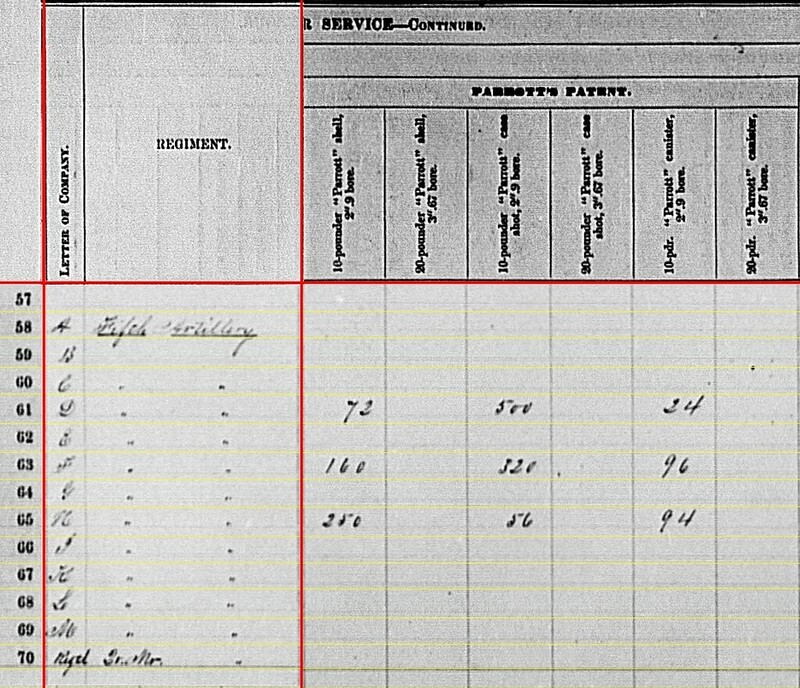 Several sources place a detachments of the 4th US Regulars at the post during the reporting period. But the annotation appears, to my eyes, as “colored.” However, keep in mind that as of December 31, 1862 there were no US Colored Troops – at least being called that by name. UPDATE: A sharp eyed reader offered another possibility, which I must agree is more likely. The word may be “Colonel” thus indicating the regimental headquarters or such. 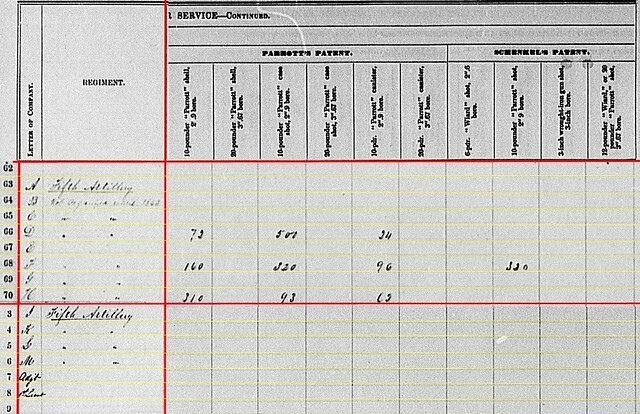 So I don’t know how to interpret the company line other than relating that line 60 included various tools and equipment at Fort Washington under the charge of the 4th Regiment. 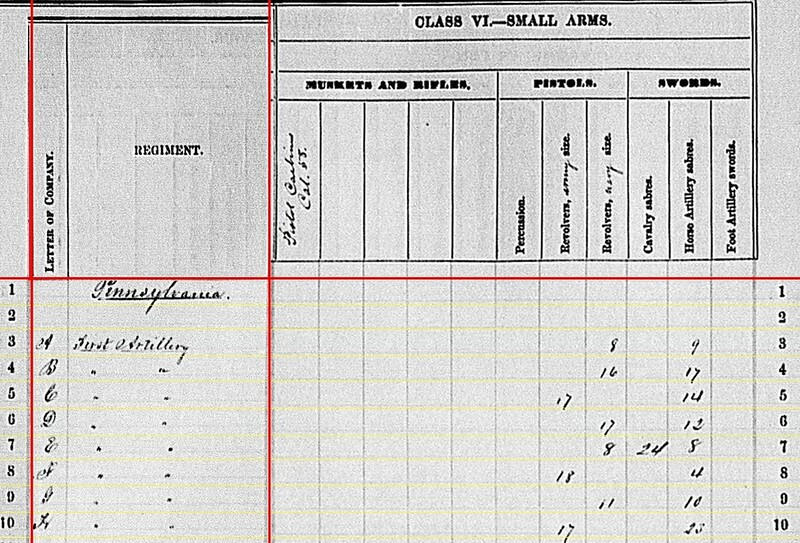 So before we get all excited about what may or may not be indicated in the company column, we see no cannon or projectiles (or even any carriages or implements) reported by this detachment. Only some small arms, which we’ll see later in the summary. Battery B: 216 shot, 92 shells, 216 case, and 92 canister for the 12-pdr. Battery C: 96 shot, 96 shell, 234 case, and 192 canister in 12-pdr Napoleon. Battery F: 252 shot, 76 shell, 252 case, and 76 canister – 12-pdr Napoleon. 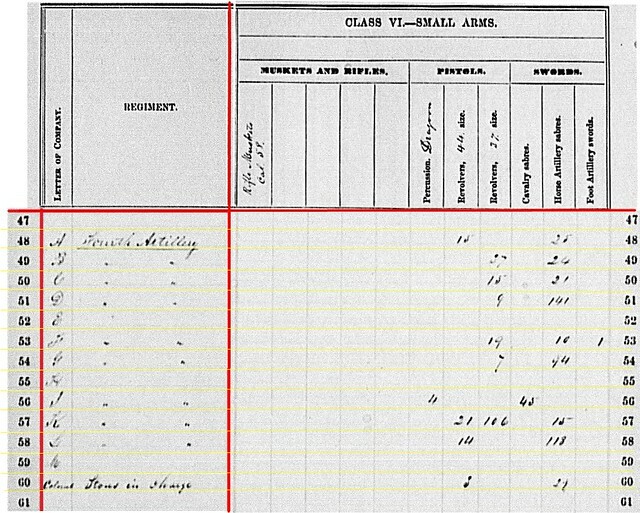 Battery G: 86 shot, 33 shell, 103 case, and 40 canister – 12-pdr Napoleon. Battery I: 261 shot, 148 case, and 42 canister for the 6-pdr field gun. Battery K: 288 shot, 96 shell, 288 case, and 96 canister – 12-pdr Napoleon. Battery L: 140 shell, 154 case, and 32 canister for the 12-pdr howitzers. Battery A: 3-inch projectiles – 120 canister, 50 percussion shell, 305 fuse shells, and 725 “bullet shell” (which I interpret as case). Battery D: 3-inch projectiles – 83 canister, 271 fuse shells, and 846 “bullet shell” for the 3-inch rifles. Battery I: 126 Parrott 10-pdr shell, 129 Parrott 10-pdr case shot, 47 Parrott 10-pdr canister, and 33 Schenkel 10-pdr shot. Battery L: 480 Parrott 10-pdr shell, 240 Parrott 10-pdr case, and 46 (or 96?) Parrott 10-pdr canister. Battery A: 15 .44-caliber revolvers and 25 horse artillery sabers. Battery B: 37 .37-caliber revolvers and 24 horse artillery sabers. Battery C: 15 .37-caliber revolvers and 21 horse artillery sabers. Battery D: 9 .37-caliber revolvers and 141 horse artillery sabers! Battery F: 19 .37-caliber revolvers, 10 horse artillery sabers, and one foot artillery saber. Battery G: 7 .37-caliber revolvers and 94 horse artillery sabers. Battery I: Four percussion “Dragoon” pistols and 45 cavalry sabers. Battery K: 21 .44-caliber revolvers, 106 .37-caliber revolvers, and 15 horse artillery sabers. Battery L: 14 .44-caliber revolvers and 118 horse artillery sabers. And Line 60 – 3 .44-caliber revolvers and 29(?) horse artillery sabers. We need to examine Battery I’s small arms in more detail. More so as a footnote. The column header is “Percussion,” with “Dragoon” written in. 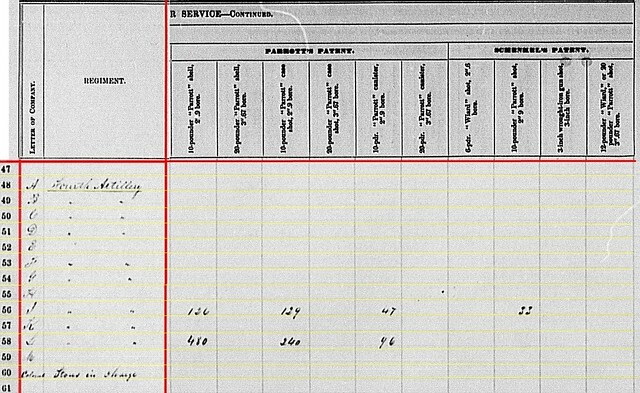 Note that the other column headers to the right are “Revolver,” with either .44 size or .37 size written in. So, it could be these were four percussion pistols of the Model 1855 or similar type. Or were those Colt’s Dragoon Revolvers? I would lean towards the latter. Lastly, as mentioned above, we have the entries for line 60 here. A handful of pistols and a few stands of sabers. Yet, as the bureaucracy required, every one of them are counted here on the form.